The approaching winter months mean colder traveling temperatures and often undesirable road conditions. They also mean it’s time to prepare your RV for another season on or off the road. These simple tips will help you prepare your RV for the upcoming chills whether you’re a winter traveler or not. 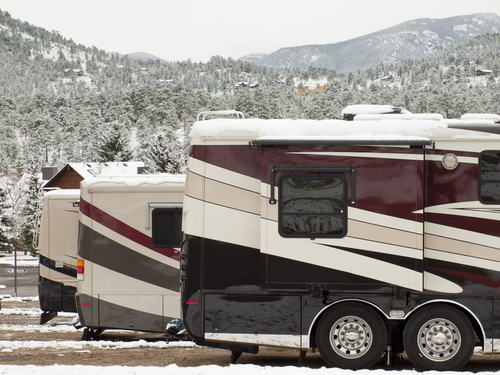 Travelers who stay on the roads in the winter months may notice their RVs become drafty this time of year. The easiest way to combat drafts is to cover windows, doors and stairwells to keep cold air from entering. Use heavy fabric curtains on windows and doors, and use a board to block your stairwell at night. RV travelers who store their RVs for the winter should always fill any leaks or holes in the RV before putting it into storage. A properly fitting RV cover is also essential for maintaining your RV’s exterior and keeping critters at bay. Cooler temperatures mean your RV’s furnace starts to eat propane, which means the season can get expensive fast. Consider using a small propane heater, which will use far less propane than your RV’s furnace, to cut the cost of propane and keep your furnace in top condition. Winter means roads covered in sleet, ice or snow. In fact, many parts of the country require RV travelers to carry chains on mountain passes in snow storms. Purchase a set of tire chains before you hit the road this winter to enjoy more peace of mind if a snow storm does hit.